The framework of our Idea System really hinges on the three I’s. Which is to say, we have the Idea, which leads to the Innovation which requires Investment – either in money or labor or both. This brings me to an exciting program I would like to share with you this week, investment through the Innovation Fund. I am proud to announce that we have funded our first ideas through this initiative. The ideas are from HealthAlliance Hospital and they both center on the principles of 5S. The first idea comes from Materials Management who would like to install standardized stocking systems on three inpatient units, the other comes from the Pharmacy department where the project looks to redesign the pharmacy code cart supplies and workflows. Congratulations teams, your ideas will be funded! The Innovation Fund is more than an investment in ideas; it is also an investment in our people and our facilities. If you have an innovative idea that needs help, I encourage you to visit the Innovation Fund webpage. For your convenience, we have created a permanent link to the page on our blog site. I am equally excited about our Idea of the Week. Following our theme of grouping things in 3’s, our featured team this week from the UMass Memorial Medical Group, used that concept as they were looking for ways to reduce the costs of printing labels used for lab specimens, pathologies and cultures. The labels can be pricey and multiple labels are required for every patient visit. 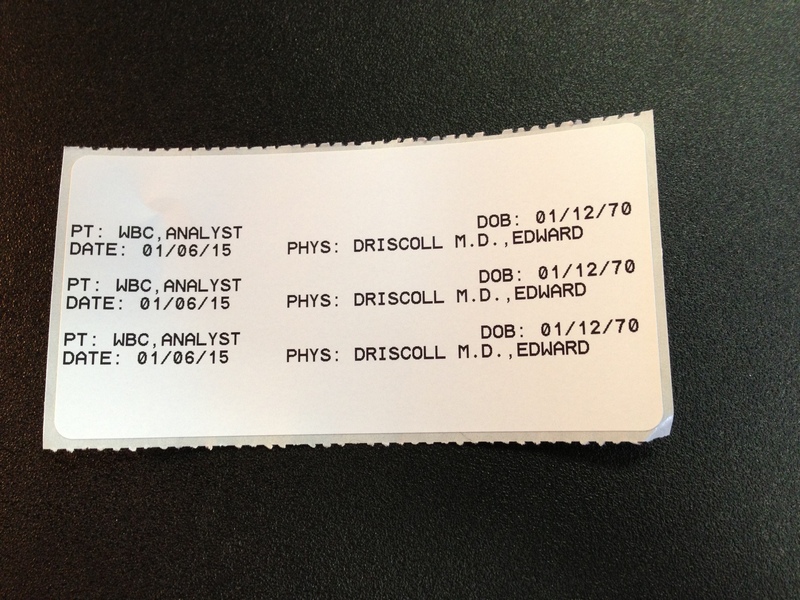 They asked their IDX team to create a new specimen label that would include the patient name, DOB, date of service and physician name. Now when the labels are sent to the printer they are prin ted in triplicate on one label. Afterward the label is cut into three parts, essentially tripling the efficiency of one single label. Fittingly, I give three cheers to the teams for these cost-saving ideas. This entry was posted in Employees, Quality by Eric Dickson, MD, MHCM. Bookmark the permalink.